1More is known for its high-quality audio products and the Piston Fit make the 1More name an affordable pick for all listeners. Monoprice is known for bang for your buck products and the Enhanced Bass Hi-Fi Earphones are no exception. The Betron YSM1000 are a great pair of earbuds for the fashion conscious. They look nice and sound fine enough for earbuds under $20. If you're looking for a pair of earbuds to toss in your gym bag, look no further. These are regarded as some of the best bang for your buck earbuds ever made, so whether you get one or ten you shouldn't be disappointed. There are plenty of reasons why you might not want to spend too much on a pair of earbuds, especially if your phone manufacturer omitted the headphone jack this time around. Regardless of what brought you here, we’re going to ease your decision-making process and present to you the best earbuds under $20. Each earbud houses a dynamic titanium driver and the nozzles extend at a 45° angle for a comfortable fit. The four colorways are iPhone-matched to fit with your iOS device, but they look just as chic with Android devices too. Partway down the right earbud rests an in-line mic and remote which allows for basic playback control and taking calls. The aluminum housings aid in mitigating internal vibration and sound distortion. Aside from that, the Piston Fit is outfitted with a tensile-resistant cable that’s wrapped around Kevlar fiber. If you’re familiar with the 1More Triple-Driver In-Ear, then you know that this Kevlar fiber design is durable. For around $15, you’re going to have a hard time finding a better all-around pair of earbuds. The Monoprice Enhanced Bass Hi-Fi earbuds are a recurring conversation piece when it comes to affordable IEMs. These ‘buds are bulky and are outfitted with an ear-hook design, much like various RHA earbuds. The low-end signature is emphasized but won’t repeatedly punch you in the eardrums. Rather, it’s just easier to perceive than vocals and the treble. Extras are hit or miss with earbuds under $20, and the Monoprice Enhanced Bass Hi-Fi doesn’t include an in-line mic and remote. If you’re constantly making calls, you may find that the 1More Piston Fit better suit your purposes. Additionally, if you’re one for tossing earbuds into a bag with reckless abandon, these aren’t your friend. They tangle easily, but for being the price of a Taco Bell dinner date, these IEMs are pretty special. If you’re in the market for earbuds under $20, there are bound to be some significantly cut corners. Unfortunately, the sound quality isn’t going to blow anyone’s socks off. Now, relative to what you’re paying, all of these options are impressive but none of them can hold a candle to something like the RHA MA650, which will run you more than double our $20 limit. The RHA MA650 cost $55 and come with plenty of extras that won’t be included with earbuds under $20. However, one of the most important factors when it comes to earbuds is seal and fit. A cogent seal will vastly improve sound quality because it isolates you from ambient noise. Investing in third-party ear tips will vastly improve sound quality. The gold accents on the Betron YSM1000 are eye-catching enough to give Flavor Flav’s grills a run for their money. A cross-hatched texture encases the earbuds’ metal housing, while the form factor retains a generally traditional aesthetic. The coated 1.2-meter cable helps to resist tangling when the ‘buds are mindlessly thrown into a coat pocket or bottomless bag. A bass-heavy sound signature defines the YSM1000 which is helpful when on public transit and you need to hear the beat above the morning grumble surrounding commuters. As far as fit goes, YSM1000 include the typical small, medium, and large ear tips. There aren’t many features here, but Betron does provide a PU leather carrying pouch to protect the headphones, pretty nice for earbuds under $20. Whether you sweat profusely on the daily is neither here nor there, but the MEE Audio M6P is a great option for exercise enthusiasts on a budget. These are IPX5-certified, meaning that they can withstand all the sweat your glands can spill onto them. These are yet another ear-hook style earbud, but it’s truly functional with the MEE Audio M6P. It provides a more secure fit while isolating noise, so you don’t have to worry about them falling out while you complete your circuit training. Need more? These include an in-line mic and remote, come with six pairs of ear tips, and a one-year manufacturer’s warranty. Overall, these are a steal for workout earbuds under $20. The Panasonic Ergo Fit is legendary. It’s accrued ~54,000 Amazon reviews, proving that we consumers love these $9 earbuds. As you may expect, it doesn’t afford a lot. However, included are three pairs of ear tips: small, medium, and large. Lacking all else, the Ergo Fit is still an outstanding deal. Audio quality is fabulous for this price point; the operative phrase being “for this price point.” The ErgoFit come in a wide array of colorways, which also happen to dictate the price. Fun fact: they were designed to pair with the iPod Nano 5th generation colors, hence the whimsy. Just because you’re paying bottom dollar doesn’t mean that you’re buying bottom shelf. As far as fit is concerned, well, they’re ergonomic. Now, what does that actually mean? They’ll stay in your ears without causing unbearable hot spots. They stay in fairly well but vigorous movement may be enough to cause them to fall out. For earbuds under $20, these are hands-down the best bang for your buck. The KZ ATE HiFi in-ears are meant to be worn ear-hook style. This lessens unwanted vibrations from traveling into the ear. KZ ATE HiFi: These were formerly the best cheap earbuds, and the ear hook design mitigates microphonics. This results in greater clarity and less external noise masking your music. Sony MDR EX15AP: These earbuds include an in-line, one-button mic and remote. You can download the Sony Smart Key app to customize control over your Android phone all for less than $15. Urophylla Earphones: These bass-boosted earbuds feature angled nozzles for an ergonomic fit and include an in-line mic and remote. MEE Audio RX18: This is the same company that manufactures the Sport-Fi M6P. If you’re constantly struggling to find cheap earbuds that fit well, your search ends here. Creative EP-630: This pair of earbuds provides listeners with an emphasized low-end and comfortable fit due to the interchangeable ear tips. OnePlus Type-C Bullets: Unfortunately, not all smartphones come with a headphone jack anymore. Even though we’ll never be okay with that, we can’t ignore the people who are ready to join that USB-C future, so if that sounds like you then definitely check out these quality ‘buds from OnePlus. 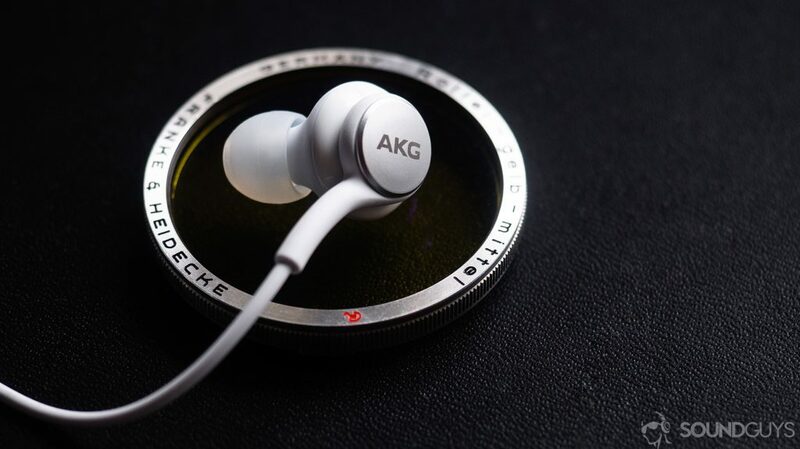 The AKG earbuds included with Samsung Galaxy S10 phones feature angled nozzles for a comfortable fit. Being that we’ve been covering the audio industry for some time, we’re acutely aware of what the top of the market is. It’s not exactly a huge mystery which companies are great at this sort of thing, and which ones… aren’t as much. However, we give everyone their fair shot because we’re not all-knowing gods of consumer audio or anything, and there are always some surprises out there. That said, we’ve culled through countless earbuds under $20 to find the best possible options for you. We’re stationed at this site day-to-day and understand that consumer and professional needs are constantly evolving. Seeing as we’re inundated with audio products, we’re able to easily sift through the noise to pick out the good from the disappointing. Each of us has multiple years of experience when it comes to keeping tabs on the audio industry and rely on that to guide our review process. Not all earbuds under $20 will include a control module. That said, we also take objective measures when applicable and just want our readers to enjoy their purchases. None of our writers may profit or benefit from steering readers to or from a certain audio device. While the site uses referral links, none of our writers will know whether or not a link was clicked. If you so choose, our ethics policy is publicly available.